Done! I was not actually so wild about the Oregon Red Clover Honey STR -- I was expecting something very different based on the pictures from the Blue Moon site, more like separated red and yellow. But, I do love how acorn-y the color is, and the gradation in color is just lovely. 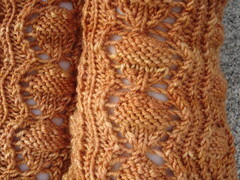 This colorway also looks awesome in Twisted, if the various photos on Ravelry are to be believed. 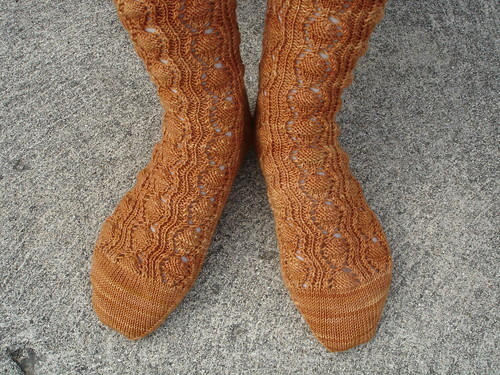 These were probably the hardest socks I've knit, mostly because of the insane number of stitches-into-one that forms the tops of the acorns. These became much more do-able when I realized that what mattered was pulling each new stitch out as far as I could, rather than starting with a really big stitch to make the other stitches into. That was a very good lesson. And even though the stitch count varies from row to row, it's not actually that difficult to keep track of. I was paying tons of attention anyway, so if I needed a stitch that wasn't there, I knew about it right away. The pattern was great, well-written and clear and way more complicated than anything I could come up with on my own. Oh, but if you're going to do all the repeats that are called for with STR, you'll need more than one skein. I think I did five cuff repeats, and didn't have enough left over for any more, but the socks are plenty tall. And now I have spent way too much time playing on the internets and must get back to packing.